QUÉBEC, le 19 avril 2013 /CNW Telbec/ – Le ministre de la Culture et des Communications, Maka Kotto, a émis, le 18 avril 2013, un avis d’intention de classement du centre commercial et communautaire du Domaine de l’Estérel, à Sainte-Marguerite-du-Lac-Masson. L’avis d’intention de classement vise l’enveloppe extérieure de la partie avant de l’immeuble la Blue Room et la cage d’escalier principal. Le ministre Kotto a également émis un avis d’intention de délimitation d’une aire de protection autour de l’immeuble. En vertu de la Loi sur le patrimoine culturel, la protection de l’immeuble patrimonial prend effet dès la transmission de l’avis d’intention de classement au propriétaire de l’immeuble visé, c’est-à-dire en date du 18 avril 2013. Il en est de même pour l’aire de protection entourant l’immeuble patrimonial. Par conséquent, le propriétaire de l’immeuble patrimonial doit dorénavant obtenir au préalable une autorisation de la part du Ministère pour toute intervention touchant le bâtiment. Certaines interventions planifiées dans l’aire de protection doivent aussi faire l’objet d’une demande d’autorisation au Ministère. 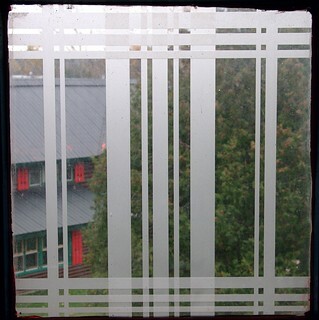 After many years of pressure from architect Jean Damecour, aided by Sandra Cohen-Rose, President of Art Déco Montréal and other members, the major building of the 1934 Domaine Estérel resort complex at Sainte-Marguerite-du-lac-Masson in the Laurentian mountains north of Montreal will be classified as an historical site by the Government of Quebec. In October, 2005, Art Déco Montréal organized a tour of Domaine Estérel during which Jean Damecour showed us this magnificent but isolated site and explained its historical and artistic significance. Jean Damecour has promoted the historical value and need for preservation of Domaine Estérel at the 10th World Congress on Art Deco in 2009 (Montreal) and the 12th World Congress on Art Deco in 2013 (Havana). A video of his presentation in Montreal can be viewed here. For more information and historical photos see the website of the Société d’Histoire de Sainte-Marguerite-du-lac-Masson et d’Estérel. Art Déco Montréal is presenting a course, in six, two hour sessions, to E.N.C.O.R.E. 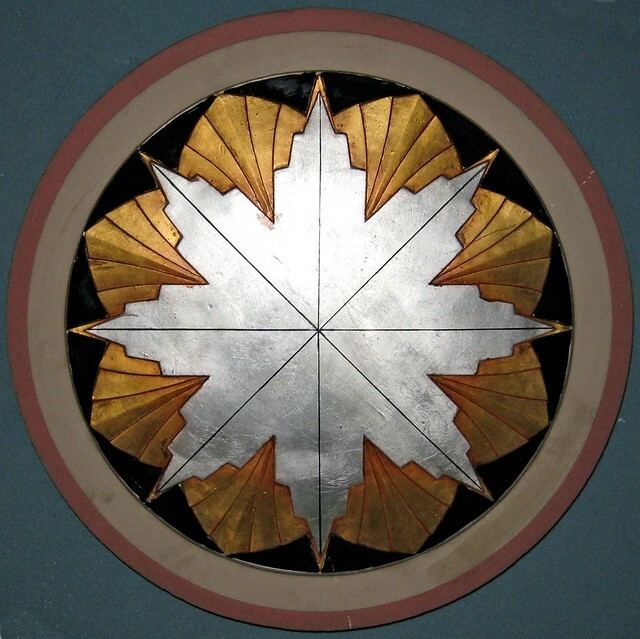 — “Northern Deco – Art Deco Architecture in Montreal.” The course given by Sandra Cohen-Rose, Jean-Yves Burgages and Jack Gaiptman, will help foster an awareness and appreciation of the architecture of this period. Talks on the history, the architects, the materials and the distinct style, include power point presentations showing examples of the buildings and architectural details. Also included are tours of Art Deco buildings. Art Déco Montréal: goals, website, interactive map, events, lectures and tours. Jean-Yves Bourdages – the origins of Art Deco. April 26 Jean-Yves Bourdages – the analysis of a building, and how to differentiate Art Deco, Streamlined Modern and Bauhaus. May 3 Jack Gaiptman – Dom Bellot, Monk-Architect. Bellotism and the architects influenced by Dom Bellot. Meeting place – in front of the Quebec Court of Appeals, 100 Notre-Dame. For all tours please wear comfortable shoes and appropriate clothing as the tours will take place regardless of the weather. Meeting place – the coffee shop next to the gift shop in the building near the crypt. There is a shuttle bus at the Queen Mary street entrance to the Oratory that will take you to the coffee shop. Parking is in front of the coffee shop or at a higher level. Meeting place – in front of our present location – 1857 de Maisonneuve West. 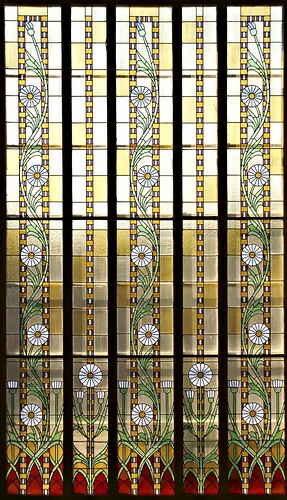 Art Deco emerged from the modernist forms of the lavishly emotive and ornamental Art Nouveau, popular in Europe around the turn of the 20th century. Initially referred to simply as the style moderne, this sleek and multifarious aesthetic came to the fore in Paris in the 1920s, and was rapidly taken up across the globe as the definitive decorative and architectural style of the interwar period. This stylistic epoch coincided with a period of extensive urban development in Montreal, resulting in numerous iconic instances of this distinctive aesthetic in commercial, institutional, and residential architecture. Art Deco Montreal has made it its mission to create a greater awareness and appreciation of the decorative and architectural arts produced in Montreal from the 1920s through the 1940s. The diverse range of Art Deco spaces in the city are far too numerous to even begin to describe. The main building of the Université de Montréal is perhaps the quintessential example. As the masterpiece of Ernest Cormier, Montreal’s foremost Art Deco architect, the building perfectly demonstrates the characteristic balance between eclecticism and unity that defines Art Deco. The interior lobby draws upon several disparate architectural traditions – from the unadorned monumental columns of ancient Egypt to the Greco-Roman style of coloured marble and dentil friezes. The prominent presence of the modernist influence is also noticeable in the lighting fixtures which hang like chandeliers proudly displaying their tubular fluorescent lights. All of these diverse influences are brought together into a perfect spatial harmony as geometric motifs engage in a rhythmic repetition between the three doors, staircases, and circular recesses in the ceiling. Every detail of the space is accounted for within a singular design scheme – even the security desk echoes the motifs of the wood and metalwork on the door frames. Through this careful amalgamation of the traditional with the new, the building stands as a monument to the university’s position as a bastion of modern thinking. In an interview with The Daily, Annmarie Adams, a professor of architecture at McGill, emphasized Art Deco’s function as a “symbol of a progressive institution.” She described the way in which this ethos of “sleek modernity jived with the missions of institutions in this period.” The lobby of the Montreal Neurological Institute also demonstrates the ways in which clean modern lines and patterning worked to revise classical traditions and build a new sort of temple to science and medicine. The use of sculptural reliefs in Art Deco exteriors – such as those illustrating a brain at the Neurological Institute, and the symbols of learning at McGill’s Peterson Hall – also serve to proclaim the ideological project of the buildings. Cohen-Rose also suggested that Art Deco can be considered directly in relation to its historical moment in time, and that its eclecticism and decorative beauty can be read as a means of masking the underlying sadness in the years following the First World War. In Montreal, Art Deco buildings serve as an artistic manifestation of the competing mentalities of the interwar period. The lavish Lion d’Or Cabaret speaks to Montreal’s liveliness as the largest east coast city unaffected by prohibition in the roaring twenties, while the Montreal Botanical Gardens also draws upon Art Deco to quite literally “lift the spirit of the people,” as it was built as part of a large scale employment stimulus project during the Great Depression. Art Deco Montreal has done much to promote an awareness of the city’s rich architectural history through a series of walking tours, lectures, and conferences. 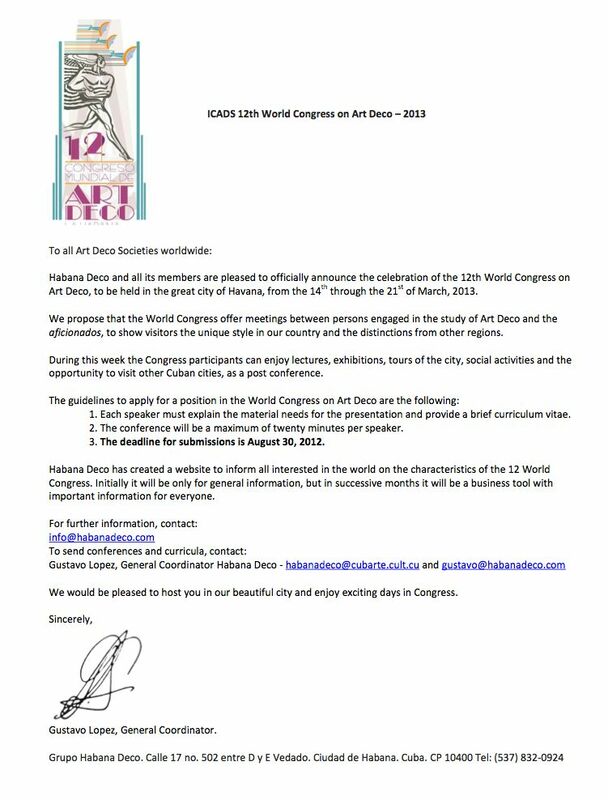 In 2009, the society hosted the resoundingly successful 10th World Congress on Art Deco. Yet although Montreal’s remarkable architectural history has achieved great international attention, it is tragically neglected by its own citizens. “We don’t appreciate what we have,” said Cohen-Rose, who founded Art Deco Montreal as a result of her dismay at the demolishment of so many great Art Deco buildings. The list of lost buildings is indeed lengthy, and includes the Kresge Building, the York Theatre, and Ben’s Deli-catessen – to name only a small sampling. Cohen-Rose also cited the ninth floor of the former Eaton’s department store – which now lies in disrepair in the new Complexe Les Ailes – as a space that is currently neglected and inaccessible to the public. 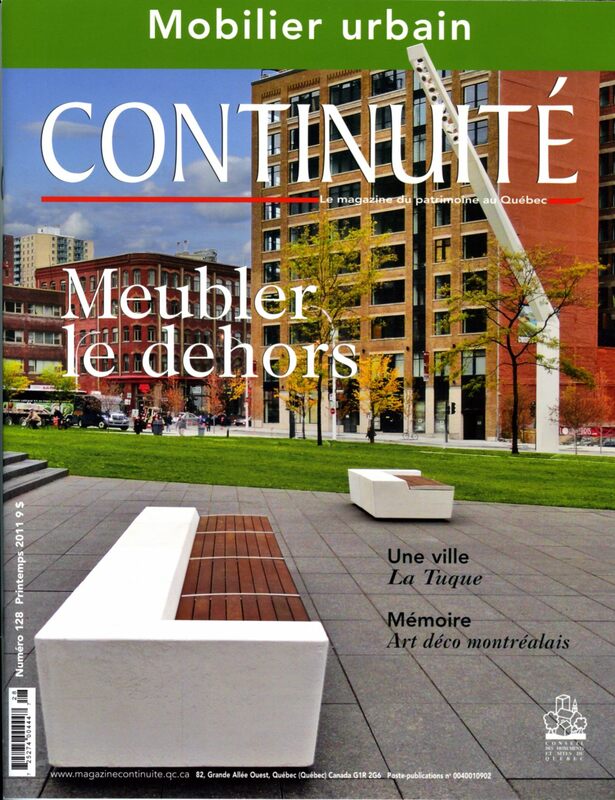 One of Art Deco Montreal’s major ongoing projects is to work towards preserving and reopening this space. 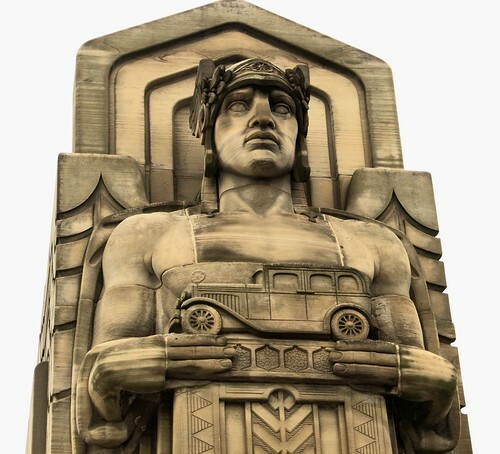 According to Cohen-Rose, Montreal is full of “wonderful things that are crying out to us.” Art Deco Montreal has made it its mission to make sure that these cries from our collective past do not fall on deaf ears. The fate of another Art Deco building hangs in the balance. Depuis décembre 2007, l’église Sainte-Marguerite-Marie, sise au 340, rue Saint-Patrice Est, à Magog, est fermée au culte. Comme dans beaucoup d’autres cas, la baisse du nombre de fidèles et le manque de ressources financières obligent la fabrique Sainte-Marguerite-Marie à se départir de l’immeuble. Bien que l’église ne fasse pas partie du répertoire de la Fondation du patrimoine religieux du Québec (elle a été construite après 1945), le répertoire patrimonial commandé par la municipalité de Magog en 2007 lui reconnaît une valeur patrimoniale supérieure par rapport aux autres bâtiments du territoire. 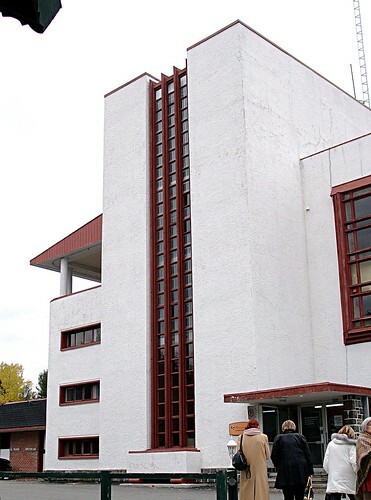 Bâtie en 1949-1950, l’église Sainte-Marguerite-Marie est inspirée du style Art déco, une rareté au Québec. Elle se démarque également des autres par son apparence à la fois moderne et traditionnelle. Son toit plat, ses formes géométriques et son ornementation très simple révèlent sa modernité; sa façade monumentale aux deux clochers symétriques et son revêtement de pierre lui confèrent un caractère traditionnel. Après quelques années de discussion et plusieurs études, le conseil municipal de Magog a récemment décidé d’aménager la nouvelle bibliothèque municipale dans cette église plutôt que de construire un édifice au centre-ville. Le recyclage de ce bâtiment patrimonial comporte de nombreux avantages autres que financiers. La préservation d’un bâtiment lié à l’histoire de la ville et de sa population, la revitalisation du quartier des Tisserands où il est situé, de même que la pertinence du point de vue de l’économie des ressources de réutiliser un bâtiment existant sont autant d’arguments qui ont joué en faveur du projet de recyclage. Présentement évalué à 10,5 millions de dollars, ce projet serait financé en partie par le ministère de la Culture, des Communications et de la Condition féminine, grâce aux subventions accordées pour les bibliothèques et à celles octroyées à une municipalité pour les bâtiments patrimoniaux qu’elle cite. Le Conseil des monuments et sites du Québec (CMSQ) considère que le recyclage de bâtiments anciens devrait être une option envisagée avec beaucoup de soin puisqu’elle offre l’opportunité d’inscrire une action de développement dans la continuité et la durabilité d’un milieu. Sauvegarder un bâtiment patrimonial est possible si cette intention s’accompagne d’un projet de valorisation ou de recyclage compatible avec sa nature. Le recyclage des églises en bibliothèques s’avère un choix des plus appropriés, comme le démontrent plusieurs exemples à travers le Québec. Pensons à la Bibliothèque de théologie du Collège Jean-de-Brébeuf ou à la bibliothèque Rina-Lasnier à Joliette. Leur emplacement au sein d’une agglomération, leurs larges volumes, leur construction solide et leur ambiance sont des avantages certains. Le CMSQ tient à féliciter la Ville de Magog pour son projet de recyclage et l’encourage fortement à poursuivre en ce sens. La valeur patrimoniale de l’église Sainte-Marguerite-Marie est indéniable, tant pour les citoyens que pour l’ensemble du Québec, et son aménagement en bibliothèque municipale lui permettra de conserver une vocation publique. Wrecking crews have started tearing down the landmark Montreal deli even though the Heritage Canada Foundation had hoped to save the building and have it listed on its inventory of endangered Canadian sites. SIDEV Realty Corp. bought the property from the family of restaurant founder Ben Kravitz two years ago and plans to build a boutique hotel on the site at Metcalfe St. and de Maisonneuve Blvd. The three-storey brick structure was designed in the sleek Streamlined Modern style by C. Davis Goodman, the same architect responsible for the Laurentian Hotel, which was torn down in 1977. Although many people expressed nostalgia for the building, Ben’s was never listed as a heritage property. On Monday, barricades went up on the sidewalk around the building, and demolition crews went to work. “We’ve started decontaminating the building, getting rid of any hazardous material that might be in the walls and the basement, and then we’ll strip the inside,” said Lorenzo Rapattoni, vice-president and general manager of Delsan Environmental Services. “In about two weeks we’ll send in mechanical shovels with shears to tear down the building.” Last fall, the McCord Museum spent a week photographing the interior, and salvaged much of Ben’s interior. “We weeded out what we wanted and kept what was interesting,” McCord curator François Cartier said. “We have the celebrity photos that were on the walls, menus, some formica tables, cutlery, plates and the machine for cutting smoked meat. All in all, it’s a pretty large selection. “Eventually, it will all be showcased in an exhibition at the McCord.” The distinctive, big red-lettered wraparound Ben’s sign has gone to Concordia University. The Musée de la personne, devoted to the city’s oral history, is taping interviews with people who worked at Ben’s and with the Kravitz family, so there will be a spoken record of the restaurant, too. Ben Kravitz opened a deli offering smoked meat on St. Laurent Blvd. in 1908. The Metcalfe St. eatery opened in 1950. Ville Marie borough council last night voted unanimously to approve demolition of landmark Ben’s delicatessen downtown at de Maisonneuve Blvd. and Metcalfe St.
City councillor Karim Boulos, head of the borough’s urban planning committee, said architectural experts had not shown any evidence that the exterior of the three-storey brick structure, built in the Streamlined Modern style in the early 1950s, was worth saving. Dinu Bumbaru, of the Heritage Montreal conservation group, said the borough had missed an opportunity to save a piece of the city’s history. SIDEV Realty Corp. plans to build a boutique hotel on the site. The borough will, however, review the overall project before any construction starts. Top Ten Most Endangered Places List on April 30, 2008. BENS Delicatessen, a Montréal Art Deco landmark with its famous wrap-around illuminated corner sign, is facing the wrecking ball. Situated on prime real estate, the building has been sold to a developer who has submitted plans to the city for a new 14-storey hotel with a restaurant on the new building’s ground floor. In spite of consistent efforts by Héritage Montréal and the Art Deco Society of Montréal to designate the building, it remains unprotected. 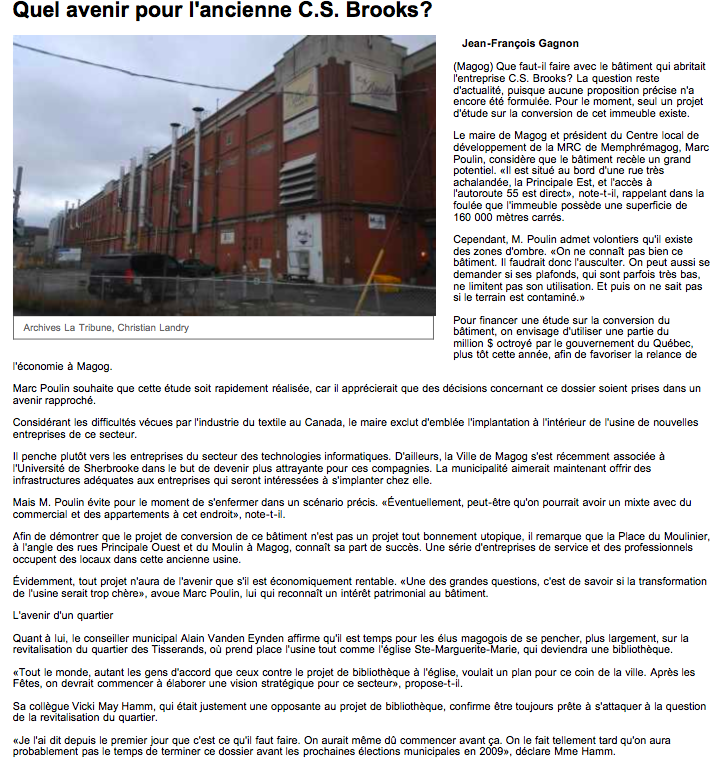 On April 3rd, the City of Montréal posted an intention to demolish notice on the building’s façade. 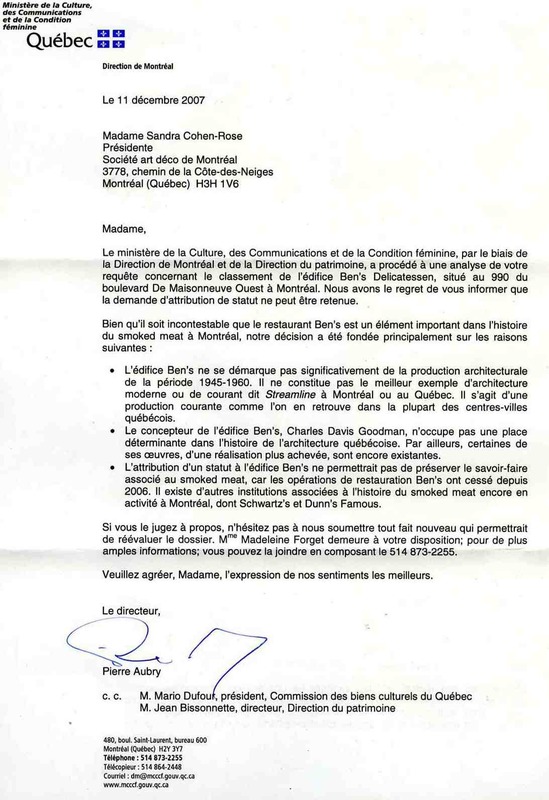 During a public meeting of the Ville-Marie borough demolition committee held on April 21st, the City, while acknowledging the architectural significance of BENS, nonetheless approved the demolition request. The approval stipulated that the restaurant be commemorated in the new structure. “If the developer had any sense he would just preserve it and build around it. 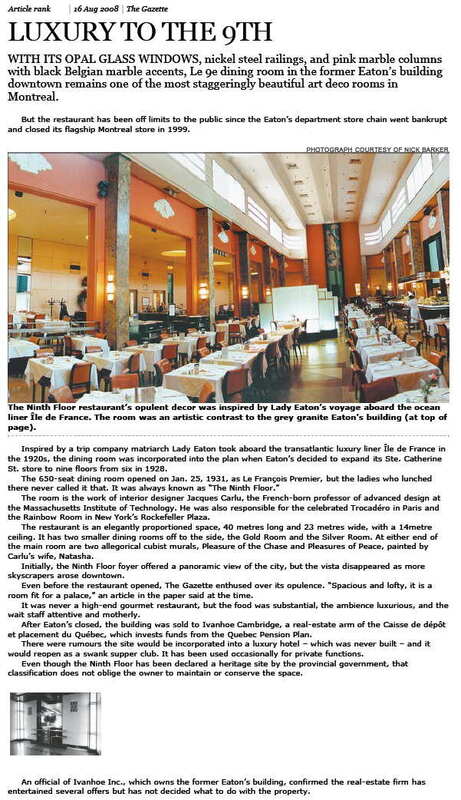 The proposed design has a restaurant on the ground floor anyway,” says Ms. Sandra Cohen Rose of Art Deco Montréal. The public has until May 21st to contest the committee’s decision to their municipal elected officials. Ben and Franny Kravitz opened BENS Delicatessen after their arrival from Lithuania in 1908. 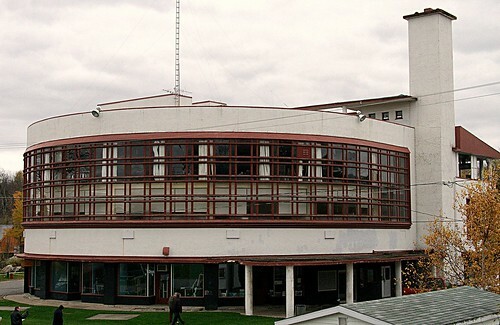 It moved to its current building designed by Charles Davis Goodman in 1950, where it remained open until 2006. Visited by thousands of tourists, BENS became the meeting place favoured by luminaries such as Leonard Cohen, former Prime Minister Pierre Elliott Trudeau, René Levesque and the Montreal Canadians hockey team. Until 2007, Ben’s headed the National Geographic Society’s 10 best delicatessens list. Autographed celebrity photos that decorated the yellow Formica and chrome deli, were a significant part of the restaurant’s appeal. While the McCord Museum has agreed to preserve the famous restaurant’s memorabilia, the Art Deco Society insists this is not enough. Montréal’s famous deli remains a classic example of Streamlined Modern design as it retains most of its original interior finishes, from the stainless steel coat racks to the sleek deli counter and stools. “The real estate tycoon who bought it has no idea of what Ben’s means to the city,” says Pop Montréal’s Dan Seligman. “They’re just hoping to go in there, destroy it, and that nobody will care. But if people actually do something, we can prevent this from happening. It would be a shame if it is demolished.” Montréal is the first North American city to join the UNESCO City of Design network. Reducing this Art Deco landmark to a few commemorative photos in a replacement building brings into question the city’s commitment to urban design values. Ironically, the International Coalition of Art Deco Societies will be holding their 2009 World Congress in Montréal, May 24-30. What do Bens delicatessen and the Alexander Bridge House in Bonavista – the oldest standing house in Newfoundland – have in common? Both are among the Top 10 endangered places in Canada, according to a new list issued by the Ottawa-based Heritage Canada Foundation yesterday. Built between 1811 and 1814, the Newfoundland house has been a sinkhole for money as preservationists have wrestled to keep the structure from collapsing from years of neglect and damage. It’s just one piece of Canada’s threatened architectural history. Other historic buildings facing a date with a demolition crew range from the Winter Street Prison in Sherbrooke and Old St. Patrick’s Church in Calgary, to the railroad roundhouse in Biggar, Sask. Some of the buildings are far from being widely recognized as heritage structures. Bens is described as a “cultural icon” and the Winnipeg International Airport is referred to as a fine example of mid-century modern architecture, according to the foundation. “I think a lot of people still think of heritage as the Victorian or Edwardian house with a lot of decorative treatment on the outside and a front porch,” said Carolyn Quinn, a spokesperson with the heritage foundation. Now, though, many industrial and commercial buildings erected since the Second World War have taken on a distinction of their own. Quinn said many people don’t appreciate more recent architecture. Quinn estimates that 20 per cent of Canada’s historic structures have been demolished, something she said is equivalent in many places to the type of destruction that follows a war. Certainly, few would dispute that the fight for old buildings can often erupt into major battles. In early April, for instance, the Montreal gave notice it intended to demolish Bens, a much-loved art deco delicatessen operating at its last location since 1950 and a hangout for the likes of Pierre Elliott Trudeau and Leonard Cohen. The developer of the valuable building site has been ordered to “commemorate” the deli in the new building that replaces it. The public has until May 21 to fight the demolition order. While it’s often far cheaper to pull a building down than maintain it, preservation is vital, historians contend. Maintaining the unique identity of communities isn’t easy though. The heritage foundation also listed the worst losses of 2007, detailing ripped-down historic buildings from coast to coast. Lost to the wrecking ball are such pieces of history as Edmonton’s Central Pentecostal Tabernacle. Designed by architect Peter Hemingway, the mid-century modernist temple was razed to make way for condos. Another award-winning architect’s work, a 1963 Vancouver house Arthur Erickson designed, came down because of a lack of maintenance. Other distinguished buildings in Windsor, Toronto and Saskatoon, among other places, were also torn down. Quinn said another reason to save older buildings is because it’s the most environmental option. She argues it’s better to reuse the buildings than consign them to a landfill. We tried hard to save BENS intact but at least we got a change in design of the project and a ruling that BENS must be prominently commemorated in the new structure. If the developer had any sense he would just preserve it and build around it. The proposed design had a restaurant on the ground floor anyway.